Substitute Joel Purkiss scored twice to rescue Matlock Town a point in a thrilling 4-4 draw at Ashton United after the Gladiators had seen a 2-0 half-time lead wiped away by a four-goal burst from the home side in the Evo-Stik Northern Premier League Premier Division this afternoon. Niall McManus put Matlock ahead before Laurie Wilson seemed to score direct from a corner. 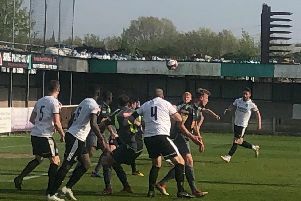 But fourth-placed Ashton were far from finished and roared into a 4-2 lead before Matlock’s double late strike in a superbly entertaining second half.